You have a mold problem on the exterior sidings of your building or house and you don’t know what to do to get rid of it? Don’t panic! FinDecor’s team is there to help. Mold can develop on any kind of surface: PVC, bricks, concrete, stucco, wood, stone, etc. Mold is born in damp spots and develops to form black or greenish dots which spread greatly throughout the months. 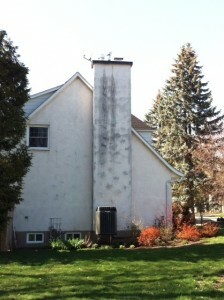 The best technique to beat mold on sidings is undoubtedly pressure washing. To do so, we use a hot water and steam washing machine which sprays a liquid using a high pressure. However, we are careful to use a lower pressure to wash wooden and other fragile surfaces so we don’t damage them. What products to use to wash down mold? In the pressure washing gun, we add boiling water and P.T.S powder (or liquid solution). P.T.S. is a trisodium phosphate frequently used as a cleaner or degreaser. It’s a corrosive product which needs to be manipulated with care: wear gloves and avoid contact with eyes. The P.T.S. will clean in depth any surface to leave it mold-free. Can I paint over mold? If you try to paint over mold to hide it, you won’t get rid of the problem. In fact, the mold will keep on spreading and will pierce through the new paint coat in a few months. The only way to definitely get rid of the problem once and for all is to proceed to an in-depth washing using trisodium phosphate. You can rely on FinDecor’s team of certified painters. Contact us to make an appointment for a free quote!